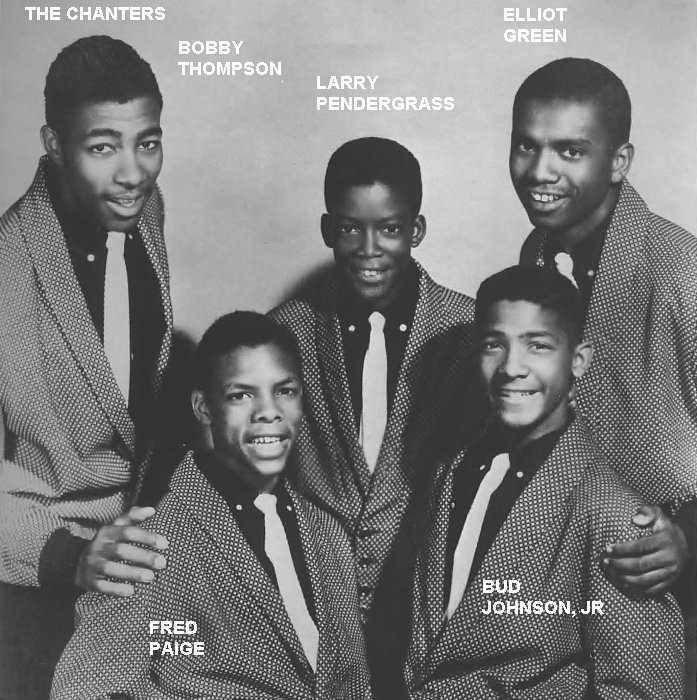 The Chanters belonged to the "kid-sound" school of Rock & Roll, which was, at the time they formed, riding high because of Frankie Lymon and the Teenagers. Once the Teenagers' sound took off, innumerable groups rushed to copy it. Most were dismal failures (as well as just plain dismal); some, like the Chanters, made serious contributions to the music. The Chanters formed in late 1957, out of a group of friends in Queens, New York. This locale was far removed from the R&B centers in Harlem and Bedford-Stuyvesant, and allowed for more original sounds from groups like the Rivileers, the Cleftones, and the Videos. 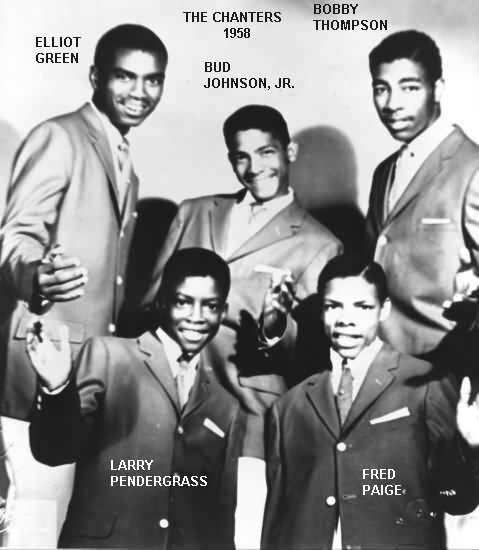 The two oldest members of the Chanters, Fred Paige (first and second tenor) and Bud Johnson, Jr. (second and first tenor) were in high school; the others-Larry Pendergrass (lead), Elliot Green (baritone) and Bobby Thompson (bass)-were in junior high. We're from Jamaica, Queens. That's in New York City, and we got together through... a friend... who happened to be in the same class that I was in, happened to invite me to his party and three guys who happened to be on the same baseball team that he was on, were there.... That would be Bud Johnson, Bobby Thompson, and Elliot Green. In the party we did what I guess most kids would in that particular period and that was start singing along with the records. One thing led to another and before I knew it, we made an appointment to meet at Bud Johnson's house three days later. At that time, Freddie Paige, who lived around the corner from Bud... he came over and we had five people then. We had a pretty good sound. They picked the name "Chanters" out of a dictionary and began to rehearse "kid-sound" songs in earnest. They also practiced, at various times, songs by the Heartbeats, the Videos, and the Imperials. Finally, Bud, Sr. took them to see Andy Gibson, an a&r man at King Records' Deluxe subsidiary. Gibson signed the group (and also produced their sessions). 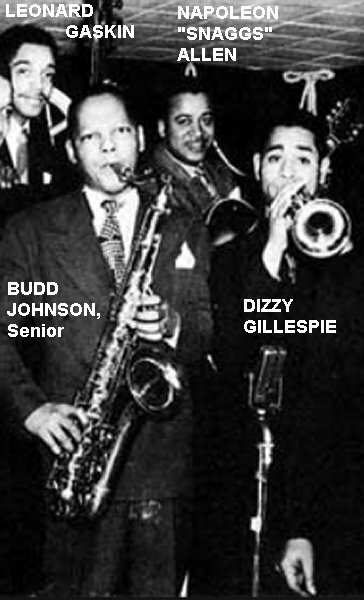 Bud, Sr. was usually their bandleader. The Chanters' first session was held on March 18, 1958. They recorded four songs, all led by Larry Pendergrass: "Stars In The Skies," "I Need Your Tenderness," "My My Darling," and "I Make This Pledge." In April, Deluxe issued "My My Darling" and "I Need Your Tenderness." The record was reviewed on April 14, with "My My Darling" receiving an "excellent" (the flip was rated "good"). Other reviews that week were for the Dells' "What You Say Baby," Frankie Lymon's "Portable On My Shoulder," the Cadillacs' "Speedo Is Back," and the Turks' "Fathertime." 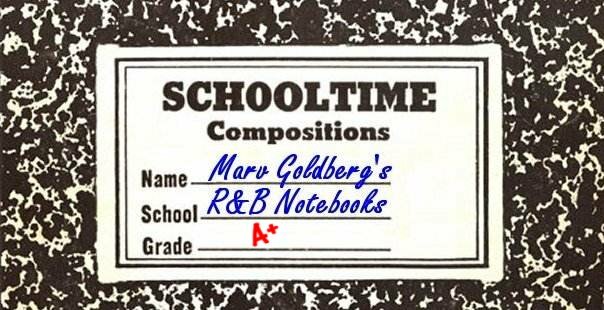 Larry Pendergrass told Lou Rallo: "The first tune that I wrote actually came from a life experience situation. I had a crush on a little girl around thirteen years old. I was about fifteen and wrote a love song and that was 'I Need Your Tenderness'." Their next session was held on May 29, 1958, and two more Larry-led tracks were laid down: "Row Your Boat" and "Over The Rainbow." A couple of weeks later, "Row Your Boat" was released, with "Stars In The Skies" as the flip. The disc got reviewed on June 23 (both sides "good"), along with Thurston Harris' "Over And Over," Bobby Day's "Over And Over," Lavern Baker's "Whipper Snapper," Big Danny Oliver's "Sapphire," the Plants' "From Me," the Shields' "You Cheated," and the Valets' "Sherry." When that didn't take off either, the Chanters were called in for their final session. On August 4, 1958, they recorded four more sides: "At My Door," "Five Little Kisses," "Angel Darling," and "No, No, No." "Angel Darling," released that same month, was led by Fred Paige. The flip ("Five Little Kisses"), as well as the other two tunes, was led by Larry. The record was reviewed on September 1 (both sides "good"), along with Little Richard's "Baby Face," the Students' "I'm So Young," the Moonglows' "The Ten Commandments Of Love," and the 5 Shillings' "Letter To An Angel." In October, Deluxe issued the final original Chanters recordings: "No, No, No," backed with "Over The Rainbow." They were reviewed ("good" again) on November 17, along with Little Richard's "Early One Morning," the Olympics' "Dance With The Teacher," Dee Clark's "Nobody But You," Lavern Baker's "I Cried A Tear," and the Del Vikings' "Flat Tire." While Bud Johnson's parents encouraged them to be singers, the relative obscurity of the Chanters is due to the fact that their parents felt they were too young to be performers. They appeared only in the New York area and even then, not at any theaters or clubs. There was supposed to be a tour, but their well-meaning parents killed that too. While they were recording as the Chanters, they did background vocals for a progressive jazz album. For the session they added another voice (that of tenor Stevie Garner) and called themselves the Voices Six. Fred wasn't sure if the album was ever released, however. Because of their parents' unwillingness to let the group travel, they became almost inactive and Fred Paige left to go into the service. He was replaced by Bud's cousin, Freddy Johnson. In the spring of 1959, the Chanters changed their name to the Voices Five and got a contract with Morty Craft. They recorded four songs for Craft (with Budd, Senior's orchestra): "For Sentimental Reasons," "On The Alamo," "Lover Come Back To Me," and "You're Driving Me Crazy." They were all issued on an LP called Big Beat Dance Party on Craft's Stere-O-Craft label in May of 1959. (All the other tunes on the LP were instrumentals, with the exception of "Sleepy Time Gal" and "Somebody Loves Me," by a duet called "Boy and Girl.") "You're Driving Me Crazy," backed with "On The Alamo" were also issued as a single in May. In July 1959, Morty Craft issued "For Sentimental Reasons," backed with the Budd Johnson (senior) solo "All Alone" as a single on his Craft label. None of these ever seems to have been reviewed. Freddy Johnson can be heard as lead on "For Sentimental Reasons," but the other leads are uncertain. Soon after the Craft recordings, Stevie Garner was added as a permanent sixth member, although the group never recorded again. In the late 60s, Bud Johnson and Stevie Garner produced "Heavenly You" and "What Are You Doing" by a Chanters group on the SSP label. Fred didn't know anything about the group, however, not even if Bud and Stevie sang in it. 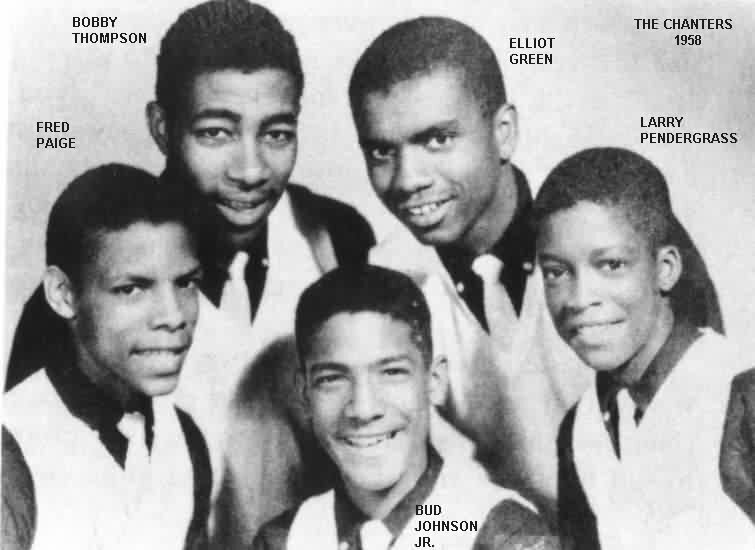 In 1966, Fred sang with the Del-Vons: Ben Monroe (lead), Earl Price (first tenor), Mickey Paige (second tenor), Ray Jackson (baritone), and George Fuller (guitar). They had one record on the Wells label: "All I Did Was Cry"/"What Are You Doing." When I interviewed him in 1978, Fred was a vocalist for a disco band called "Pages Of History." Fred remembered the great music, and so do we. The Chanters were one of the best "Kid Sound" groups around, giving us "My My Darling," "At My Door," "Five Little Kisses," and "No, No, No." AS "BUDD JOHNSON & THE VOICES FIVE"